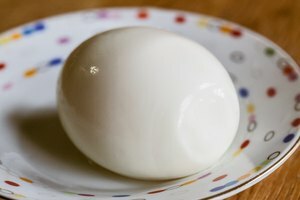 When you boil an egg, a physical change actually occurs that causes it to harden. The time it takes to hard-boil an egg depends on the size of the egg. Give the egg time to reach room temperature, usually about 12 to 15 minutes. Place the egg(s) in a pan of water and wait for it to boil (about eight to 10 minutes; less time if you cover the pan with a lid). You can also add a pinch of salt to the water to get it to boil faster. Once the water has begun to boil, reduce the heat down to simmer and remove the lid. This is where the size of the egg becomes important. For hard-boiled eggs, medium eggs should be left in the simmering water for 11 minutes, 12 minutes for large eggs, and 13 minutes for jumbo eggs. For soft-boiled eggs, large eggs should be left to simmer for five minutes, medium eggs four minutes, and jumbo eggs for six minutes. For medium boiled eggs, large eggs should simmer for seven minutes, medium eggs for six minutes, and jumbo eggs for eight minutes. 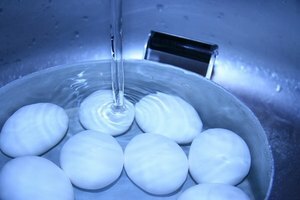 When the time's up, remove the eggs from the pan and place them in cold water for 10 to 15 minutes. 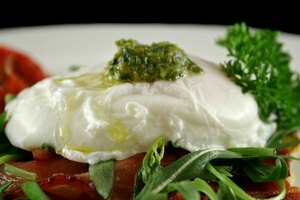 Higher altitudes can affect the way your eggs boil. In higher altitudes, water boils at a lower temperature. 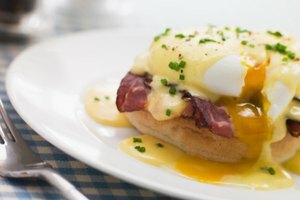 As a result, eggs have to boil longer to become hard-boiled. Allow your eggs to simmer for few extra minutes after they've boiled to try to make up for this. Finding the right amount of time to boil your eggs can be a process of trial and error, so just see what works best. If you're cooking a lot of eggs at once, it can take a little bit longer for them to cook. This is a result of the extra water you need to use to accommodate the large quantity of eggs. Make sure to take this into account when you're boiling your eggs. Allow them more time to simmer. One great way to time your eggs without all the hassle is to use an egg timer for boiling eggs. This timer is a plastic, egg-shaped device that is placed in the water with your eggs. As your eggs boil, the red background on the egg timer begins to disappear. There are different markings on this background that show whether the eggs are hard- or soft-boiled. When the timer indicates that the eggs are cooked how you'd like them, remove the timer and eggs from the pan and place in cold water.